The expressive fine art print represents the nucleus of my art and craft. Each print is a labor of love and a work of art that will beautify and energize virtually any space. All color photographs are printed on fine art cotton rag paper with Ultrachrome K3 inks and all monochrome photographs are printed on fine art cotton rag with warm/sepia-tone carbon pigment inks. My materials and techniques are gold-standard in their class and my prints are an elegant accompaniment to any home, office, or boardroom. All Limited Edition prints are hand-signed in the lower right margin and numbered in the lower left. There is a vast difference in viewing photographs on a computer display versus seeing fine art prints in person; only the latter exudes the light, depth, texture, and delicate nuances of my photographs and the materials on which they are printed. Loose print only: No mounting, matting, or frame. 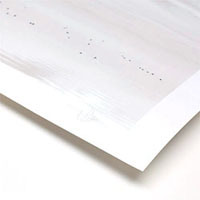 All loose prints include a one-inch border, signed in the lower right margin and edition numbered in the lower left. Matted prints: Mounted and matted with natural white archival rag mats, no frame. Prints are hand signed in the lower right and edition numbered in the lower left. Ideal for those who prefer to choose their own frame to match existing decor. 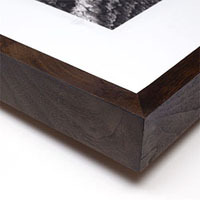 Dark Walnut framing: Mounted and matted with natural white archival rag mat, finished with an elegant hand-made solid dark walnut frame. Prints are hand signed in the lower right and edition numbered in the lower left. Arrives ready-to-hang. 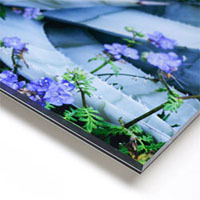 Acrylic Facemount: A striking and contemporary frame-less finishing method. 1/4" thick acrylic glazing with flame-polished edges, backed by an aluminum or wood sub-frame with French cleat for hanging. The art appears to float off the wall and the visual appearance is described as "like being there". Arrives ready-to-hang. Open Edition Mini-Prints: All photographs on this website are available as unsigned 8" Mini-Prints. 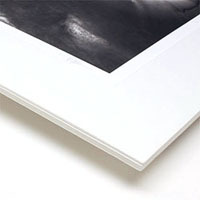 All rectangular/panoramic photographs are printed to 8" on the their longest side, and square images are printed to 7". Open Edition Mini-Prints are made using the same top-quality archival materials as my Limited Edition prints and they arrive mounted/matted and ready to be inserted into off-the-shelf 11x14" frames. All Mini-Print purchases may be applied as a discount toward the future purchase of any Limited Edition print (maximum discount per Limited Edition print is $39). To take advantage of this offer, Please contact Michael. Simply click the Purchase Prints link found beneath every photograph and follow all the prompts. All purchases are processed through PayPal. Designers and Consultants: Please contact Michael to discuss quantity discounts and ordering.